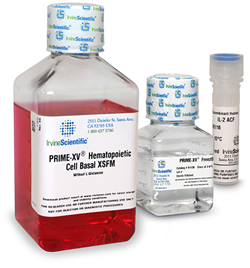 FUJIFILM Irvine Scientific® offers the PRIME-XV® Media Portfolio comprising xeno- and serum-free media for utilization in cell therapy and regenerative medicine. Validated culture optimized expansion media for T cells, MSCs, Neutral Cells, Amniotic Fluid Stem Cells (AFSCs), Cancer Stem/Initiating Cells or human/murine Hematopoietic Cells (HPCs) and differentiation media for osteogenesis, adipogenesis and chondrogenesis are manufactured under full cGMP conditions and fulfill CE regulations∗. Cell cryopreservation solutions, various substrates and animal-component-free recombinant growth factors complete the portfolio. First data with this new chemically-defined medium (CDM) are published in a POSTER available in the download area below. Produced entirely animal-component-free (ACF) in an E.coli expression system. Please inquire for the entire range! The ability to preserve and thaw primary and stem cells has tremendous potential in allogenic and autologous transplants for clinical therapeutic applications. FUJIFILM Irvine Scientific&apos;s cryopreservation products are formulated as chemically-defined, protein-free solutions that are manufactured under GMP. ∗PRIME-XV® products are usually processed under cGMP conditions and for research or further manufacturing use only.